Last night severe weather warnings here on top of the hill. And then amazing rain, wind all night. This morning our neatly protected vegetable seeds might have all moved to another part if the garden. Torrential rains have a way of making that happen. Row covers will be reset this morning. Hopeful most seeds are where we put them. 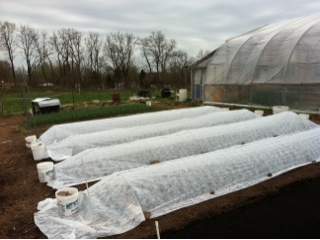 Today's sunshine and warm will let us know...sprouting happens quick this time if year. With temperatures below freezing tonight, some things will need draining, covering and disconnecting at days end.